If only the two consecutive weekends of Kelly Rossum gigs were not farewell appearances! But sooner or later, it is inevitable that top echelon artists will look east for inspiration and opportunities, and we wish Kelly well as he tackles new challenges in the Big Apple. Before he takes off, however, he celebrates the release of Conflict, a duet set with drummer Phil Hey, recorded live during a Late Night at the Dakota gig. Why is the release at the AQ instead of the Dakota? Maybe that’s part of the “conflict?” Regardless, the recording is every bit as unpredictable, challenging, and intriguing as one would expect from this pair. It’s like listening to an intense conversation between two creative and headstrong individuals who somehow find a point of collaboration while still following their own inner urges. The conversation is at times mellow, at times more “conflicted,” sometimes aggressive, sometimes humorous. The first sets on Friday and Saturday at the AQ (8/21-22) will be the duet; second sets will feature the Phil Hey Trio with Bryan Nichols and Adam Linz; the final sets will be the full quartet. Come early, stay late. You might never see these configurations again. And buy the CD. Since clearly great things occur on the Dakota stage during the late night gigs, be sure to check out Monk in Motian on Saturday night at 11:30 pm. Earlier in the evening you can catch one of the great blues guitarists, Duke Robillard, but be sure to stick around for Late Night. Monk in Motian was spawned about two years ago by guitarists Zacc Harris and Park Evans, taking the music of Monk as interpreted by the great electric band of Paul Motian, and given a Minnesota spritz. This weekend, usual cohorts Harris, Evans and saxman Scott Fultz bring in Chris Thomson and the Bates brothers (Chris and JT) to put a somewhat different spin on their always fascinating translations of the Monk repertoire. For a south of the border jolt to start the weekend, Café Maude hosts Viviana Pintado, Ray Rivera and Matt Darling in a piano/trombone/percussion rhumba, while Nachito Herrera hosts his monthly Havana party at the Dakota, both tonight (8/21). There’s still a bit of summer left which means a few more weeks of free, outdoor gigs across all genres of music. Sunday night (8/23), the sublime pair of Charmin (Michelle) and Shapira (Joel) serenade at the Wolf Park Amphitheater in St. Louis Park, 7-8 pm. Tuesday (8/25) I plan to trek over to the Como Park Pavillion and catch the Acme Jazz Company. This 19-piece band covers the gamut of jazz. I haven’t heard them yet but my attention was piqued when I learned that young Geoff LeCrone is holding down the guitar chair in a sea of veteran musicians, including his former Minnetonka High School bandleader, Miles Mortenson. 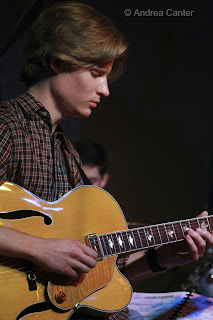 Geoff, who was part of the second edition of the Dakota Combo in 2007-08, has been studying guitar with Joan Griffith at St. Thomas. Acme plays weekly at O’Gara’s in St. Paul. 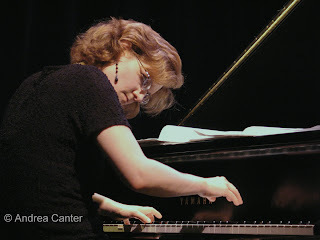 Two chances this week to catch the Laura Caviani Trio, tonight at Crave with Lucia Newell and Thursday at the AQ with Gordy Johnson and Dave Schmalenberger. The AQ gig is Laura’s first with her trio since mangling her hand in a car accident early this summer. She’s been back at Crave and with the X-Tet since, clearly no permanent damage. And two chances to catch Charmin Michelle and Denny Malmberg at Fireside Pizza, Monday and Wednesday, in Richfield. Coming soon: Next weekend is really the finale for Kelly Rossum and his quartet, Friday and Saturday nights at the Dakota. The 10 pm set on Saturday features German organist Barbara Dennerlein with Kelly and JT Bates. Sunday from noon til 10 pm is a benefit for ailing Dean Magraw, one of the area’s favorite and most eclectic guitarists who is battling lymphoma. This benefit is at the Celtic Junction in St. Paul; there will be another benefit October 11th at the AQ. Also on August 30th, early evening, come celebrate Jeanne Arland Peterson’s #88 birthday and double retrospective CD release at the AQ. September 3rd, European pianist and bandleader Amina Figarova will be at the Dakota. A big hit at the 2008 TC Jazz Festival, Figarova is one of the most creative composers and arrangers working in modern jazz. And I hear a few tickets remain for Chick Corea/Stanley Clarke/Lenny White on September 7-8 at the Dakota. 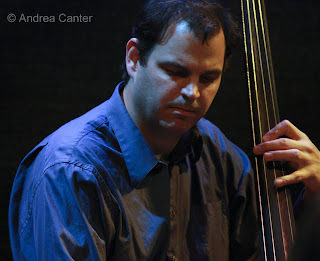 For a listing of daily, weekly or monthly jazz in the Twin Cities, check Pamela’s blog at http://www.bebopified.blogspot.com/, also linked via Jazz Police, JazzINK, and the TCJS websites.